Buy a shirt to support Dysautonomia International! All funds raised will go directly to Dysautonomia International Inc .
>> The Tilt Table Test: the main diagnostic test used to determine whether or not someone has POTS. The patient is strapped to the table at an 80 degree angle, head upright, and has their vitals monitored for the upwards of a half hour. Enduring this test is a badge of honor. >> Midodrine, one of the most common medications given to POTS patients to help with their blood flow, because our bodies need some help regulating it. >> Hydration, the single most important thing we can do to stay healthy. >> Sodium, the key ingredient to every one of our meals--a POTSy diet is one high in salt. October, Dysautonomia Awareness Month, is right around the corner. Buy a shirt to show your POTS Pride and support Dysautonomia International's ongoing goals of raising awareness, advocating for patients everywhere on local, state, and federal levels, and advancing research by providing research grants for projects that will help us find a cure for dysautonomia. A note about the product options for the shirts: For anyone with fabric sensitivities or sensory processing disorders that dislike cotton, I highly recommend the Heather Graphite option--it is a poly/cotton blend and is buttery soft to the touch. The black and turquoise options are pre-shrunk ringspun cotton, very comfortable, and well fitted. Read more about the shirts here. I've been volunteering for Dysautonomia International since I was 21 and it has changed my life for the better. It's my goal that no dysautonomia patient will ever feel alone in their diagnosis, that we eliminate the diagnostic delay dysautonomia patients endure completely, and that we find a cure as soon as possible. 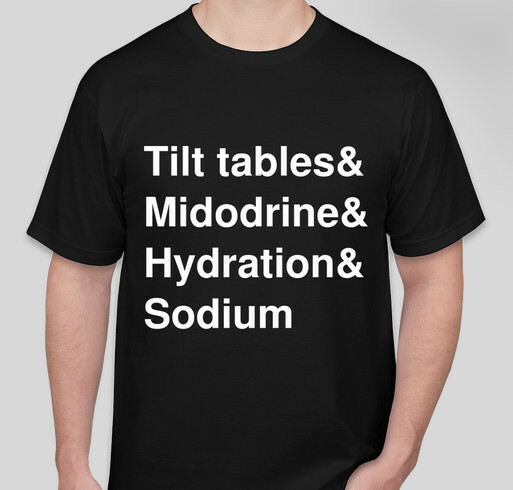 Share Why You Support "POTS: Tilt tables & Midodrine & Hydration & Sodium"